Sometimes standard items work so well that it’s hard to see how they can be improved. 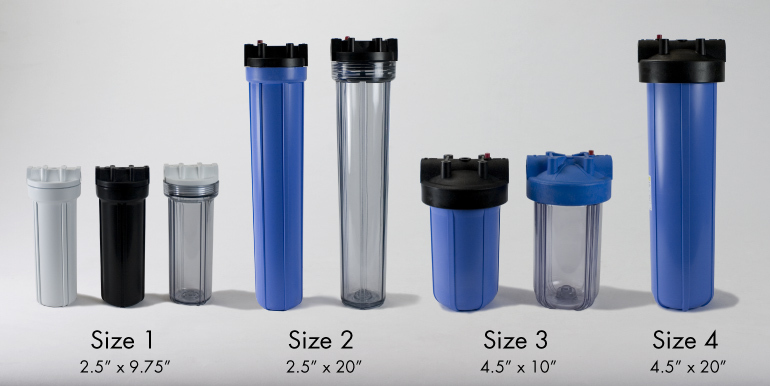 This has been the case with what is commonly called the “Big Blue” water filter containers that hold the standard-sized 4.5″ diameter filter cartridges — either 10″ or 20″ in length. There is now an improvement over the Big Blue that makes cartridge changes easier, makes o-ring replacement usually unnecessary, and virtually assures leak-free cartridge replacement. Our new Easy-Off housings from Viqua use a unique lock ring seal that simply presses the sump. 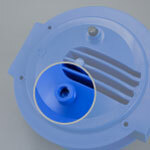 With conventional housings, the sump is screwed into the cap by twisting the sump. The lock-ring design does away with the problem of pinched o-rings and o-rings that are flattened by over-tightening. The picture shows the lock ring held by the wrench. The ring can actually be hand tightened onto the blue threads of the cap to make a perfect seal. Only the ring turns; the sump itself does not turn but is pressed tightly against the cap by the tightening of the lock ring. 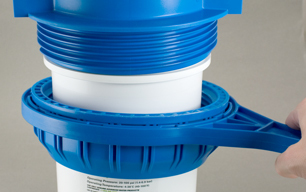 The advanced housing has other features that set it apart from conventional filter vessels. One very nice feature is a pre-tapped cap that allows for easy addition of a pressure gauge. The bottom of the sump is also pre-tapped and capped so that the sump can be drained from the bottom if desired. 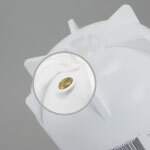 A pressure gauge can be easily installed on the cap. Bottom drain plug can be removed with a screwdriver. One final note: The Easy-Off housings work only with radial style cartridges. They can’t be used for axial filters. 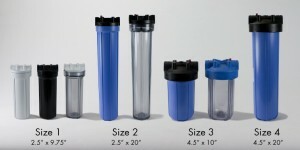 Radial style includes all carbon blocks and sediment cartridges. Axials are mainly media cartridges: cartridges with an impermeable outer shell that are usually filled with granular media. The test is, if you can pick the cartridge up and look through the center hole like a telescope, the new housings will work. If you can’t see all the way through, the cartridge can’t be used with the new Easy-Off housings. The new housings are sold with wrench, mounting bracket, and screws, so the only thing more you need to make a whole house filter is a filter cartridge.